This workshop will be conducted live online via the "Zoom" system. You will need an online computer or tablet. A phone can be used, but the photo will be small. 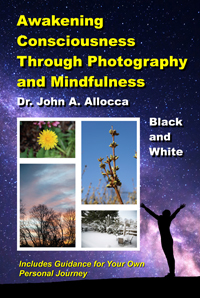 The journey will follow the Native American Medicine Wheel and based on the book "Introduction to Consciousness Through Photography and Mindfulness." Photography is the basic tool used in this journey. Any camera or cell phone can be used. This class is entirely devoted to self-discovery without discussion of religious views or beliefs. The Native American Medicine Wheel is a tool used in this class for the purpose of self-discovery without any religious context. The Native American Medicine Wheel has been used for thousands of years for healing and transformation. It uses the four directions, connecting us to the forces pf nature and the cycles of life. Movement in the Medicine Wheel is circular in a clockwise direction. The directions can also represent stages of life such as; birth, youth, adult, death; or seasons of the year such as spring, summer, winter, fall; or aspects of life such as spiritual, emotional, intellectual, physical; or elements of nature such as fire, air, water, and earth; or animals such as eagle, snake, jaguar, buffalo, and many others. You will also be able to communicate with your classmates through our forum. 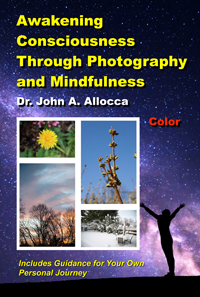 You will be required to purchase and read the book "Introduction to Consciousness Through Photography and Mindfulness" prior to the workshop. The fees will be $50 per session. You will be required to register and pay a fee at least 1 week prior to the first class. Saturday May 4, 2029, 1-3 pm eastern USA time. Saturday June 1, 2019, 1-3 pm eastern USA time. Saturday July 6, 2019, 1-3 pm eastern USA time. Saturday August 3, 2019, 1-3 pm eastern USA time. Saturday September 7, 2019, 1-3 pm eastern USA time. Saturday October 5, 2019, 1-3 pm eastern USA time. Saturday November 2, 2019, 1-3 pm eastern USA time. Saturday December 7, 2019, 1-3 pm eastern USA time. Saturday January 4, 2020, 1-3 pm eastern USA time. Saturday February 1, 2020, 1-3 pm eastern USA time. Saturday March 7, 2020, 1-3 pm eastern USA time. This forum is private for this group only. Once registered you will be able to post comments and reply to comments at any time. To avoid spam and unregistered users, only Dr. Allocca can register you for the forum. You will receive a user name and password from him via email. You will be required to register and pay a fee at least 24 hours prior to each class.